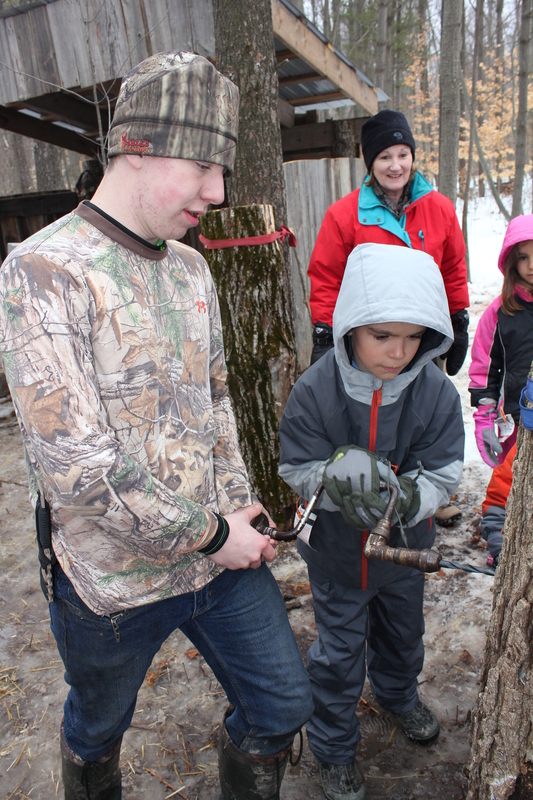 Bring your class to the farm and learn all about maple syrup production and much, much more. Our 2 hour program includes a wagon ride to the sugar bush, explanations of modern and early syrup making, a tour of the sugar shanty and evaporator, learning how to tap a tree, a chance to make maple taffy, learning about the different tools used in making maple syrup, and of course, experience the taste of pure maple syrup on some fresh, hot pancakes. Tours are available on weekdays from February 25th to April 5th, 2019. Dress for the weather we will be outside! Parent volunteers pay the same as students. Teachers and assistants are free. Due to wagon load restrictions, we can accommodate a maximum of approximately 80 people (including supervisors) in a school group. Please fill out our sign up form to book your tour. We will reply to confirm if your chosen date is available. Get your students out of the classroom and into a fresh educational environment. We are gearing up for our 14th season of hosting school groups at our farm. The stations hidden around the 2018 corn maze provide a glimpse into the joys and challenges of a year in the life of our fictional farm family Farmer Fred and his wife Frieda. Students of all ages will benefit from the experience. We also host school tours in the spring time at the maple sugar bush. Option A: From dirt to butter. Students will think like a pioneer farmer, circa 1860 for the day. Students will see an old plow and learn what a pioneer would have to do in order to plow, clear land, or plant crops. Farmer James will talk about his great great grandfather who farmed and some of the equipment he might have used. Many of the pieces of equipment are on display for students to see and use in our heritage barn. Students get to finish off the day by whipping cream to make butter. This program also includes time in the corn maze OR a wagon ride to our neighbour’s apple orchard and apple picking. How does our educational corn maze program meet the Ontario Curriculum expectations? Option B: Meet Mr. Bear and Mr. Hare, the two lovable characters in the story “Tops and Bottoms” as told by Farmer James. Mr. Bear learns from the wily Mr. Hare about which vegetables grow above the ground and which ones grow under the ground. This option is popular with our early primary school groups and provides an age appropriate and fun introduction to how pumpkins grow. 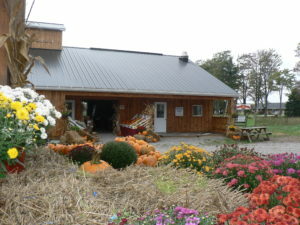 Includes time in the corn maze OR a wagon ride to our neighbour’s apple orchard and apple picking. Option C: Take on the challenge of the corn maze and go on a wagon ride to pick apples. We are available for school tours Monday to Friday in October.